Most of the time when I prepare meals, I’d think of using chicken simply because chicken is one of my family’s favourite foods. It’s not expensive, a good source of protein, last but not least, it’s versatile. It could be roasted, broiled, grilled or poached, and combined with a wide range of herbs and spices, or whatever I can try. Amongst all parts/cuts of chicken, drumsticks contain less fat and are cheaper than chicken breast. When it comes to baking, I like drumsticks. The meat of drumsticks is juicier. My family tends to prefer baked drumsticks to chicken breast. Previously, I grilled organic drumsticks, that was a hit in my family. This time, I also adapted the previous method, baked them after a brief pan-frying. This method shortened much cooking time. The browning of chicken skins was easier to be controlled. 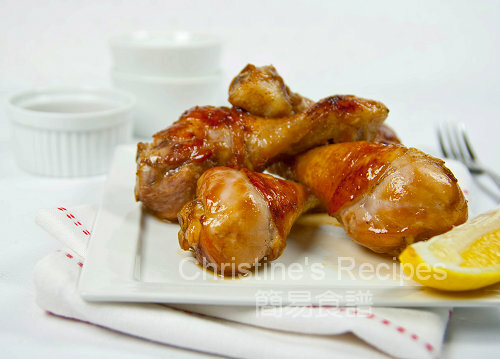 All the juice was coated inside and kept the drumsticks moist after baking. The marinade I used for the chicken is of oriental taste. Rinse drumsticks and wipe dry with paper towels. Use a needle to insert drumsticks on all surfaces and help absorb marinade. Mix marinade with drumsticks well. Cover and place in fridge for 1 to 2 hours. 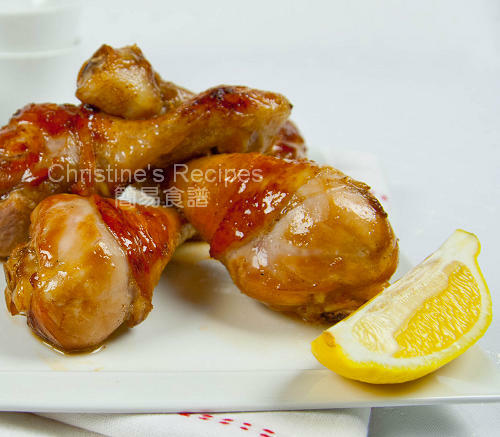 The longer the drumsticks are marinated, the richer the flavour they would absorb. Marinade for overnight if permitted. Heat 2 tablespoons of oil on a fry pan. Add drumsticks and cook until all surfaces lightly brown. Transfer to a baking pan. Bake for 10 to 15 minutes. Then turn the other side and continue to cook for another 10 minutes. Brush them with honey and bake for another 5 minutes until cooked through. Insert a needle in the thickest part. If clear liquid runs out, it’s done. Serve hot with lemon juice. Try to use free range chicken drumsticks. The taste is far better than those caged ones. If you can use organic drumsticks, it’s the best choice. It might cost a bit more, yet it’s worth every dollar. Either place the drumsticks on the middle rack of oven, or in the broiler compartment. Keep an eye on them when baking because you don’t want your drumsticks get burnt before being cooked through. As the power of every oven varies considerably, you have to adjust the time of baking. Simple and delicious - just the way I like it! Yum! So good with soy sauce & honey, scrumptious! Those look delicious - perfect for Superbowl! Love the skin on that chicken, yum! Oh yum - you have me craving drumsticks - soy sauce and honey is one of my favorite flavor combos! I tried your recipe tonight and it was so good! My 3 kids (ages 2,4 & 7) and hubby LOVED it. :) Hello from Canada! Hello, I was wondering how many drumsticks do i use for 900G? Sorry, didn't count and no record here. It's enough to feed about 4 people. Hi Christine, thank you for sharing this recipe. Quick question though...are we supposed to add the marinade to the baking dish so that there will be sauce? Can I replace rice wine with yellow wine? Yes, feel free to experiment what you like.